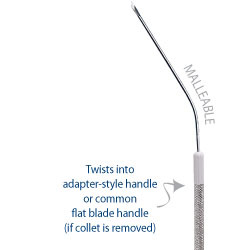 Two types of myringotomy blades in various styles are available to meet surgical preferences. Blades are hollow-ground to produce the thinnest edge possible for unsurpassed sharpness. 5 blade designs are available to meet your needs and preferences. These hollow-ground blades produce the thinnest edge possible, for unsurpassed sharpness. Five blade designs are available to meet your needs and preferences. Blades are available in two versions to fit reusable handle styles — Collet-Style or Adapter-Style and commonly used flat blade handles. All * marked blades are for use with the Collet-Style Handle (BL-0425). All ** marked blades are for use with the Adapter-Style Handle (BL-1425). Blades require a Flatstock handle. Knives include a molded handle. *All products are sterile, single-use unless otherwise noted.